Had a relatively free day yesterday and managed to knock out the test models to a modicum of satisfaction! After the yellow was complete I went back in to clean up and block in any metallic areas with black, as well as the shoulder pad rims and other parts that would end up being black. Tried out the red/white sergeant/veteran helmet option on one of the models and am quite pleased with how it turned out. 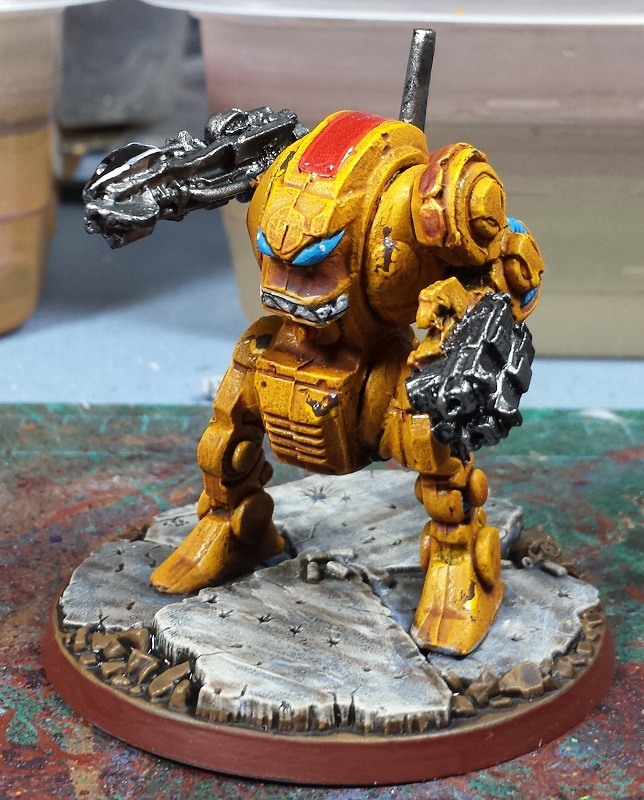 Gave the dread a little red as well just to break up the vast swathes of yellow a bit. 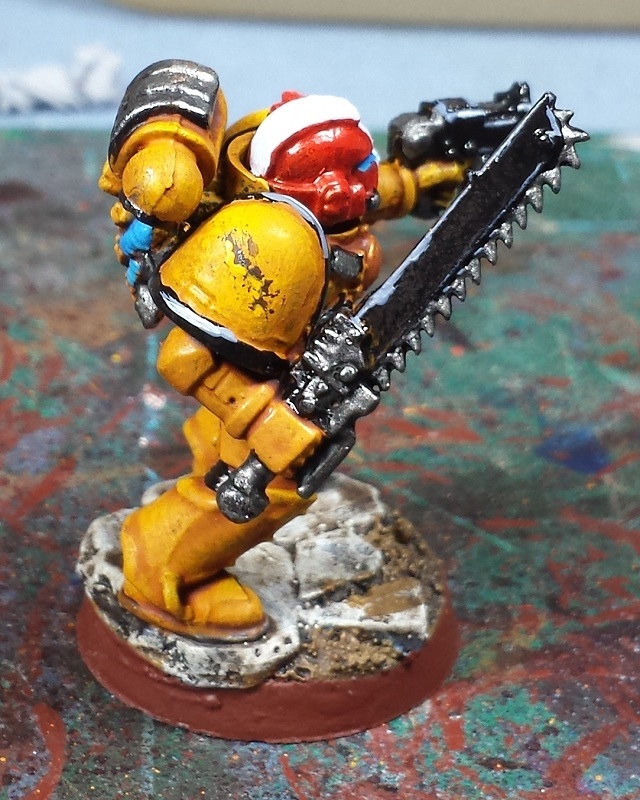 Tried a bit of edge highlighting on the black shoulder rims and weapons, just a quick slap-on for test purposes, will definitely be taking my time on the resin models! I think I need to mix a bottle of 50:50 shadow grey and black to give myself one more midtone though (and maybe one 50:50 shadow grey and ghost grey as well) - the color contrasts feel a little too stark as it stands, definitely needs a smoother gradient. A few more washes, some fine detail work and we're pretty much good to go! Overall I'm pretty pleased with the final look - I'll be the first to admit they're a somewhat sloppy paintjob on rather goopy minis but as a proof of concept I'm feeling confident to move on to the resin stage! Went with my usual blue cabling look, which sets off nicely against the yellow as a spot color. Wanted to keep the bases predominantly light, the ones that will be going on the real models will have a couple different light stone colors. I tried to do a quasi-marbled effect with some washes, but mostly I think it just looks like sloppy application. Not going that route on the final models, but will rather stick to drybrushed stone built up from a cool grey on some parts and up from earthtones on others. 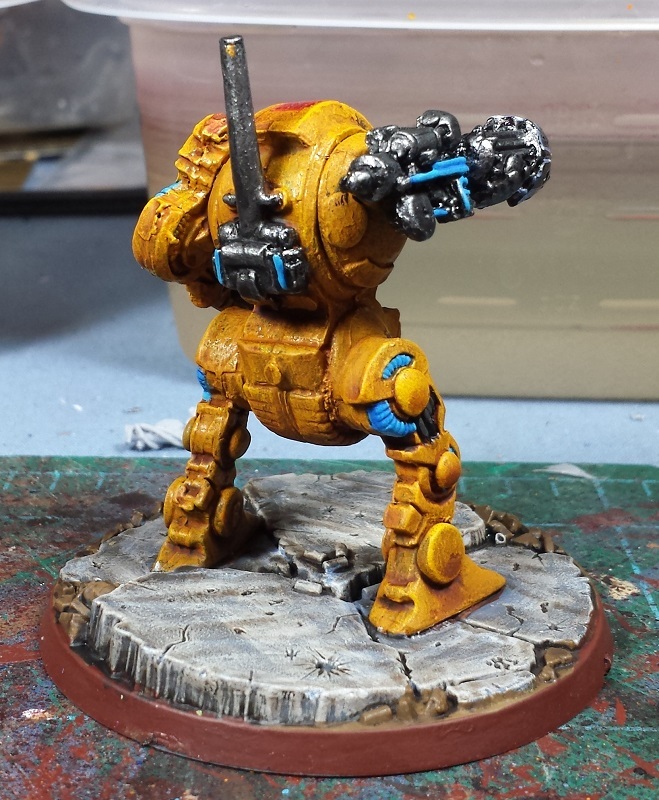 Keep it neutral so the yellow of the model really pops! A definite blast from the past here - This RT-Era Eddy model is one of the oldest in my collection, and was purchased at the very first gaming store I ever went to back in the late 80s. It's been sitting in a box in bits along with his stumpy-legged little brother Chuck in varying iterations of the Closet of Doom ever since! 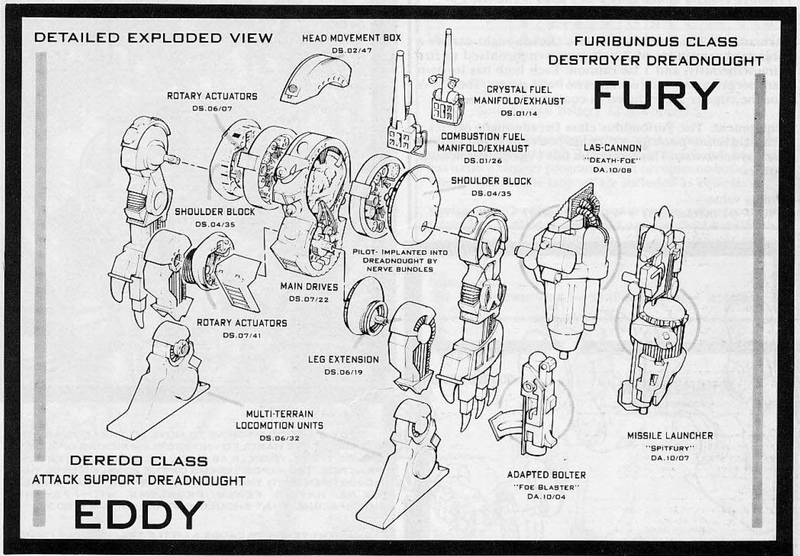 Way back in the RT era the Contemptor aka "Chuck" class was armed with a pair of power fists and bolters, the Deredo aka "Eddy" had the missile launcher (a bit of a nod to that from FW on their re-imagining of it) and the Furibundus aka "Fury" carried a lascannon. I'm quite interested to see whether FW does a Fury at some point in the future! 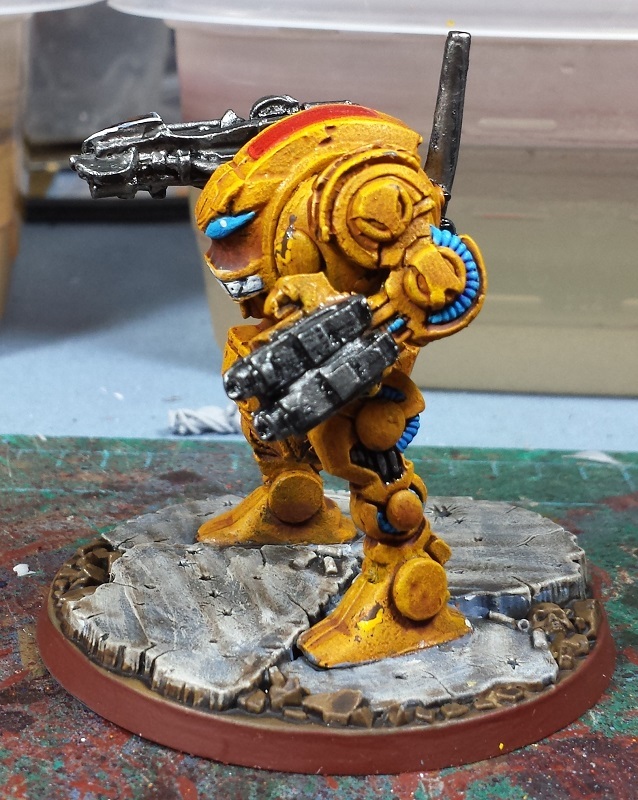 Finally, I did a little dabbling on some weathering effects, sponging on charred brown and highlighting it with yellow on the lower edges to try and give it a semi 3D effect. A bit more practice is needed, but I'm sure I'll get my eye in by the time the army's done! 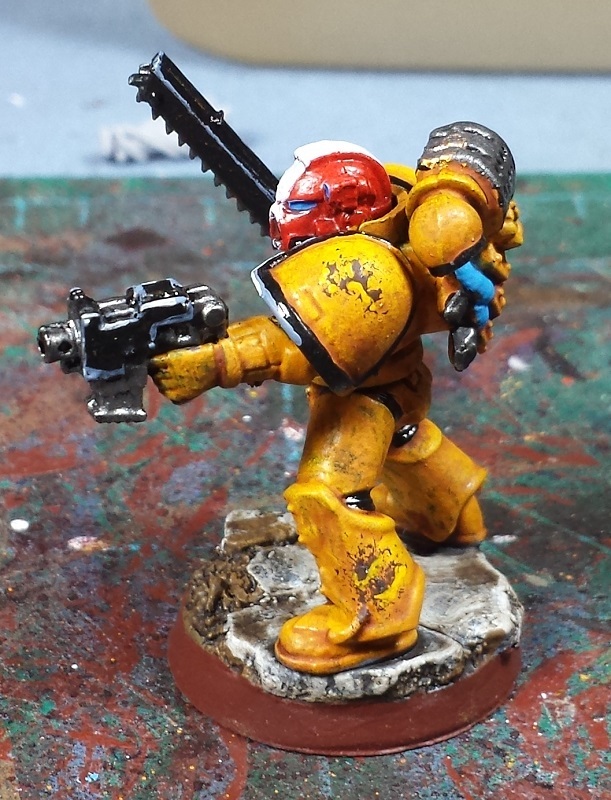 Excellent job on the yellows (a color that has both tempted and tortured me over the years). Lovin' the old Dread too. A buddy of mine has 2 that he uses quite often, always as venerable dreads! I finally sold my old RT Eddy dread'some months back. Sad to see it go, but am hoping it ended up with a person who'll give it the love it deserved. I think you've hit the yellow on the nose - perfect imo. The red splach colours really help the minis pop too. You're right on the black edge highlights though - far too much of a contrast. @Zab: Excellent! I look forward to see it! @Zzzzzz: Excellent! The old peanut dreads are definitely a nostalgia trip! @Da Masta Cheef: Thanks very much, man! @Dai: Cheers man! Yeah, I'm not pleased with the black edge highlights, way too stark. Will definitely be adjusting that aspect of the scheme!